The necropolis is located west of Alexandria in the Wardian district. The tomb is dated to the 2nd century BC and was built for a rich man in Alexandria during the Roman era. 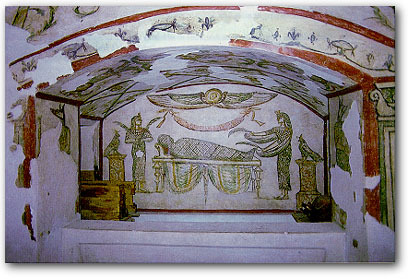 The decoration of the tomb is influenced by the ancient Egyptian motifs of funerary art. In the tomb is a mural of a mummified corpse that was laid on a bier and a figure of two mourners connected with the goddesses Nephthys and Isis. On the top of the bier is the winged sun-disk.